David Weinberger spoke at the 2010 MarketingProfs B2B Forum in Boston. His topic: The Power of the New Digital Disorder. 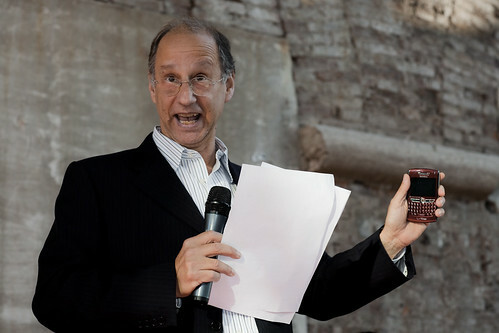 To put things into perspective, David Weinberger is co-author of the The Cluetrain Manifesto written in 2000, and considered profound in its exhortation to think differently about markets and connection. It is from this book that "markets are conversations" comes. "The Cluetrain Manifesto ... outlined how people needed to change their way of thinking to take advantage of the opportunities created by the connectiveness of the Web. It's now 10 years later and marketers continue to think of the Web in traditional terms that can obscure the depth of the change our businesses and culture are going through. In this provocative keynote presentation, David Weinberger will show how the Web has rewritten our most basic understanding of how business works ... and how, by embracing these changes and thinking differently, businesses can build stronger relationships with customers and partners than ever before." Weinberger explained that, for the past ~100 years, we've treated business as a fort where walls control information, people and supplies. The Internet knocked down these walls because people talk to one another. As a result, people outside the walls became better sources of information about the business than those within specifically because they were engaged in conversation with those with experience. Markets and businesses are actually networks mixing people together via the Internet. 2. Always different, always changing, fluid and have nothing to do with traditional markets which are stable chunks based on sameness so you can send the same messages and easily manage them. 4. Integrated channels: for the first time in human history, the information medium = communications medium = social medium, all happening at the same time. The web doesn't respect boundaries [like life]; it's connected, and looks for shared interests. Interests level rank, making rank less visible. When rank does appear, it's inhibiting. Doing social media, but be sure to get some things right! Admit you're human. Engage in the political model [love/hate you]. Stand for something and explain why. Consider advocacy marketing which is transparent about sources and interests, and committed to better conversation. It's much better to be transparent about disagreement rather than dripping with phony agreeableness. Business sites need to be truthful, reliable, clear about specifics and offer exact information. Don't fake it! Be sure to have a strategy in place so you can say something meaninful. Here's an interesting twist: markets are conversations, however, not all conversations are markets. It's critically important to resist opportunities, resist always engaging, keep it human, and respect the conversation. The Internet and its ensuing digital disorder represent plenty of opportunities as long as the Internet remains open and those using it fully embrace it. You can follow David Weinberger via his blog, www.JoHotheBlog.com and via Twittter @dweinberger. For a terrific summary of Weinberger's presentation, read David Weinberger to MarketingProfs B2B Forum 2010: Not All Conversations Are Markets (#mpb2b) by Peg Mulligan at Content for a Convergent World. You might enjoy some Weinberger Wisdom as well as hearing David Weinberger talking on the subject of Everything in Miscellaneous on YouTube. Thank you for mentioning my summary. 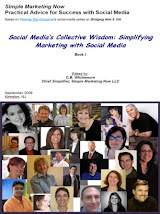 I enjoyed reading your analysis and notes from Weinberger's MarketingProfs presentation as well. It was such a great keynote, actionable as well as engaging. I just viewed the "Everything Is Miscellaneous" video you embedded here, and I was struck by Weinberger's comment that if you stucture and order information too perfectly, that you actually lose a huge amount of information, which costs your business in terms of its ability to innovate. "Innovation generally happens at the messy intersection of ideas..."
Thanks as always, for an informative post. Peg, thanks for calling further attention to Weinberger's comments. As you highlight, he does an excellent job of encouraging open-mindedness and creativity, but with a practical business-focused mindset. He reminded me that the messy chaos we are surrounded by is rich, vibrant and exciting - yes, overwhelming at times, but definitely a source of innovation. I always enjoy your comments. Thanks very much! AOC2: Don't Be Myopic About Social Media! How Do I Do Twitter?